Wow, are we bad at blog posting this summer! The first part of the summer compromised of working and babysitting a lot, while the past month has seemed to have evaporated away in the midst of shopping and otherwise preparing for college. We leave on Wednesday, which is hard to imagine! Leah and I are attending the same college, which I believe we mentioned here before, but my dorm is located about a mile away from Leah’s and we have no classes together, so we will likely have pretty different freshman year experiences. We’re both excited, but of course this is going to be a big adjustment! The flatbread I’m posting about today has nothing to do with college (except for the fact that I’m going to have to go several months without cooking, sadly), but it is delicious! We took pizza dough and brushed it with garlic-infused olive oil. 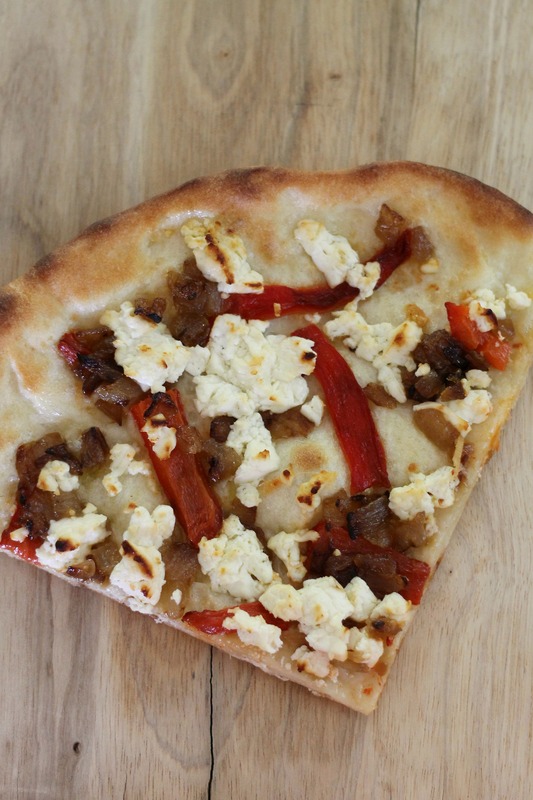 We then sprinkled it with caramelized onions, crumbled feta, and roasted red peppers and baked it in a flaming hot oven until crisp. The combination was wonderful and we really enjoyed this flatbread. Preheat oven to 500-550 with a pizza stone located on the middle rack. Heat olive oil, garlic, and red pepper flakes in a small saucepan until garlic begins to sizzle and the mixture is fragrant. Flatten the pizza dough until very thin and brush with some of the garlic oil. Top with caramelized onions, roasted red pepper pieces, and onions. Transfer pizza to stone and bake for about 10 minutes, or until the crust is brown and crisp around the edges. Let cool briefly, then slice and serve. Enjoy!